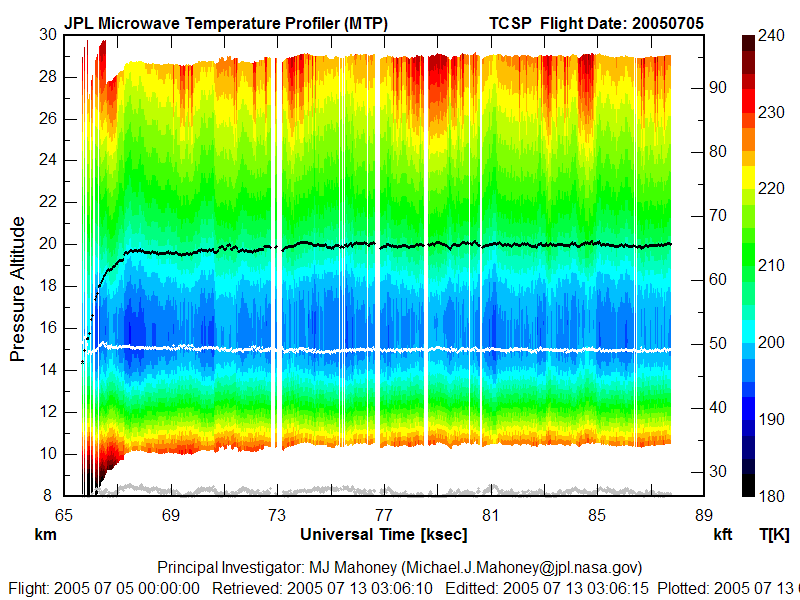 The TCSP ER-2 Microwave Temperature Profiler (MTP) dataset was collected by the ER-2 Microwave Temperature Profiler (MTP), which is a passive microwave radiometer which measures the thermal emission from oxygen molecules in the atmosphere for a selection of elevation angles (normally 10 between +60 and -58 degrees). The current observing frequencies are 55.5, 56.6 and 58.8 GHz. Measured 'brightness temperature' versus elevation angle is converted to air temperature versus altitude using a modified statistical retrieval procedure with a Bayesian component. An altitude temperature profile (ATP) is produced in this manner every 13 seconds or approximately 3 km along the flight path. The ATP can be used to produce a color-coded temperature curtain (CTC) of the temperature field which the ER2 has flown through, and to identify the tropopause location. ATPs can also be used to locate altitudes where the air is cold enough to condense nitric acid or water vapor to form polar stratospheric clouds (PSCs). The TCSP mission collected data for research and documentation of cyclogenesis, the interaction of temperature, humidity, precipitation, wind and air pressure that creates ideal birthing conditions for tropical storms, hurricanes and related phenomena. The goal of this mission was to help us better understand how hurricanes and other tropical storms are formed and intensify. Archived by National Aeronautics and Space Administration, U.S. Government, NASA/MSFC/GHRC. https://doi.org/10.5067/TCSP/MTP/DATA201. Mahoney, Michael J.2006. TCSP ER-2 MICROWAVE TEMPERATURE PROFILER (MTP) indicate subset used. Dataset available online from the NASA Global Hydrology Resource Center DAAC, Huntsville, Alabama, U.S.A. DOI: http://dx.doi.org/10.5067/TCSP/MTP/DATA201.